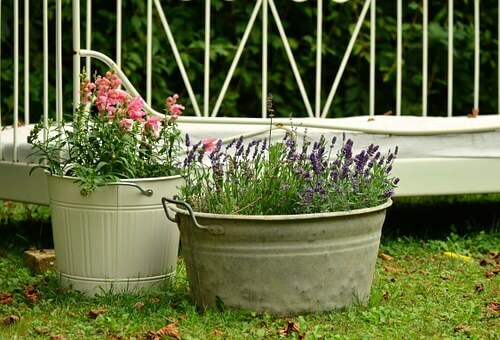 From old boots and tool boxes to discarded pallets and paint cans, DIY container gardens can be made out of just about anything. The only limit is your creativity! 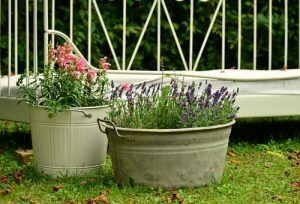 If you are thinking about sprucing up your yard with a homemade container garden, there are a few tips and tricks that can help make your project a green-thumbed success. Georgia can get hot in the summer months, so making sure you choose the right flowers and plants for your garden is key. At Ace of Gray, our garden center specializes in beautiful flowers like Black-Eyed Susans, California Poppies and Sunflowers, all of which do well in Georgia’s hot and humid summer climate. Container Gardens are extremely popular these days, and rightly so! They are easy to make, they take advantage of existing materials that would otherwise be thrown in the trash and they are a ton of fun! Once you’ve chosen the containers you want to use and added the requisite decorations, you’ll need to make sure there are drain holes set about an inch apart throughout the bottom of your container. A simple drill and pilot bit are all you need for this. Your plants will come in planting containers. If they are small enough to fit your decorative container, it is perfectly fine to place your flowers directly inside. Otherwise, you will need a small amount of potting soil. Fill your container with the soil, stopping about an inch from the top. Dig out a hole big enough for your plant’s root ball, place the root ball into the soil and fill in around it with more soil. Whether you want to hang your container garden or add it as decoration to a walkway, we have all the hardware and supplies you will need. For more tips on how to create a stunning DIY container garden for your home, give us a call or stop by Ace of Gray today!